Every time I make my own Scratch Chicken Stock, I always have to wonder why I don’t make it all the time. The taste far surpasses store-bought stock, and the benefit of it being completely clean cannot be overlooked. There are a couple other awesome benefits to making your own stock. First, it is CHEAP!! You use a whole chicken carcass that you hopefully made for another dinner. I roasted a chicken last night and then immediately recycled the bones for the stock. The remaining ingredients are staples most of us have, or that are easy to find. My recipe made about 20 cups of stock, which is about 12 cans of store-bought stock. Couple that with knowing where the ingredients came from and a far superior flavor, there really is no good reason to buy mass-produced stock again. This recipe can also be used to make beef stock by using marrow or “soup” bones. NOTE: This recipe is based on using the chicken carcass and drippings from my Simple Roasted Chicken Recipe. If you are starting without the roasted chicken, you may instead use a whole chicken. You may just need to adjust the salt. You can also consider using a pre-made rotisserie chicken. Place all ingredients, except for water in a large stock pot. Cover with water so all ingredients are covered. Add as much water as your pot can hold. Allow to simmer for 5 hours – 10 hours. The longer you simmer your stalk, the more flavor that is extracted from the ingredients and the more golden color your stock takes on. When you are happy with the depth of your stock, turn off the heat and allow the soup to cool to room temperature. Place the cooled pot of soup in the refrigerator until cold. 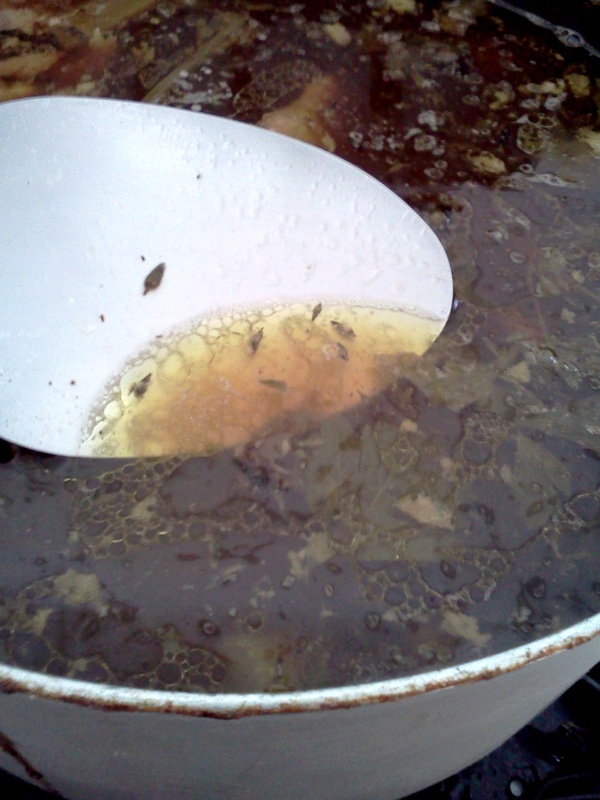 The fat in the stock should have solidified as the soup cooled. Take a spoon and skim the fat off your stock. Place a mesh strainer over a bowl large enough to hold your stock. Pour the stock through the strainer to remove all solids from the stock. Discard everything left in the strainer. Separate stock into storage containers and freeze the reserves you will not be using in the next 3 days. Stock is good in the fridge for about 3 days, or freeze for up to 3 months! This entry was posted in Recipes and tagged cheap recipe, chicken, chicken broth, clean eating, pantry recipe, recipe, soup, staple, stock by reneeh. Bookmark the permalink. I love homemade stock! My mom makes it in mass quantities and pressure cans it so I almost always have it on hand, it’s the best! Homemade stock is so easy! Sadly, my freezer space is tight, so I just make it whenever I have a leftover carcass and save it for a recipe that really needs the great flavor (like my recent Italian Wedding Soup). Good for you to make your own! It’s hard to use the box stuff after that! I wish I had more ambition to make homemade stock. I know it’s so worth it but it always seems to labor intensive… clearly I’m wrong, though, because yours looks doable! Maybe this weekend I’ll give it a go! I like to make Turkey stock after thanksgiving. Waste not, want not! I am completely addicted to mason jars right now! This is fantastic! 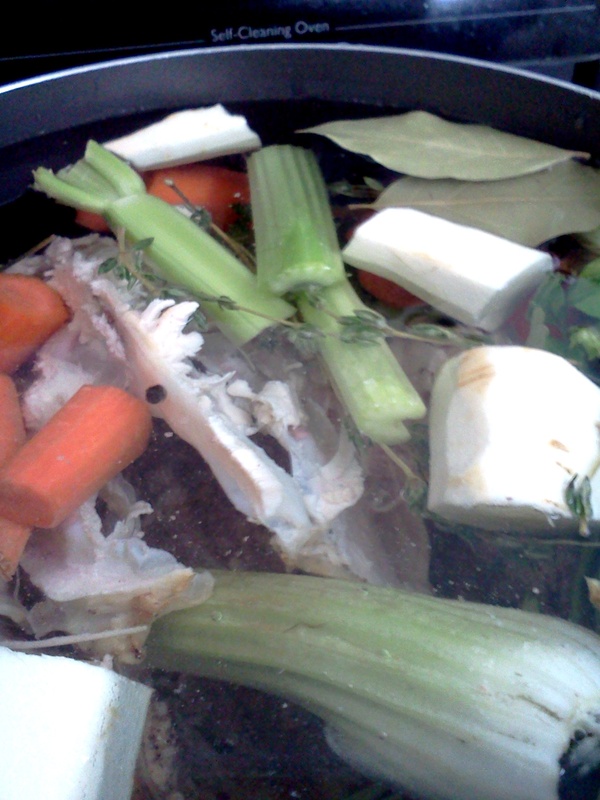 I’ve always wanted to know how to make chicken stock, but it always seemed so daunting. Your recipe seems totally doable. I’m going to give it a try! YES! Awesome. I love making chicken stock. I think my next post is going to be a chicken stock post. Now you’ll have to start using it, or else you’ll end up like me and be a candidate for an episode of Stock Hoarders. I really need to get on the homemade stock wagon. It’s just too good to pass up! Yes! I was just thinking I don’t make chicken stock nearly enough, but it is so easy and worth it!